The report finds that this year there were 6,290 arrivals to Italy, the lowest figure reported since 2014. In the first quarter of 2018, Hellenic authorities registered 7,343 arrivals, a 67% increase compared to the 4,407 reported in the same period in 2017. 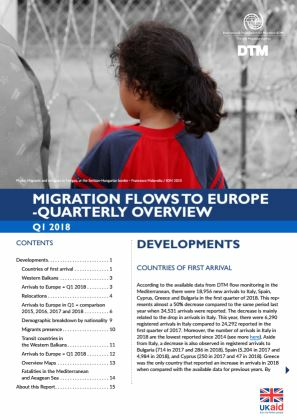 Spanish authorities registered 4,984 arrivals in the first quarter of 2018, a slight (4%) decrease compared to 5,204 reported in the same period 2017. More than 2,400 irregular migrants were registered in Bosnia and Herzegovina (1,314), Albania (396) and Montenegro (759). Between October 2015 and March 2018, a total of 34,456 individuals took part in the EU Relocation program.